The beach is calling for me!!!!! I don’t know why we planned our beach trip to be so late in the summer. Maybe it’s because it’ll give me a little extra time to burn off all those cookie calories so I can squeeze into the bathing suit, or maybe so Mother Nature can get her act together and make it hot outside for a change! Finally we’re at 90 degrees…I need to be near water…NOW!! I do know one reason why we wait is that all the kiddies will be back in school and it’ll be less crowded. Good for me and good for the tot with her most recent I-can’t-deal-with-crowds phase. Speaking of the tot, she’s going through this crazy growth spurt, too. She drinks a gallon of milk within 2 days, all the crackers are gone in a day, all the grapes are gone the moment I open the bag, and she’s still going crazy over those yogurt bites that taste weird, at least to me! Freeze-dried yogurt pieces…I’ll pass, but whatever floats that girly’s boat, she still loves yogurt bites. 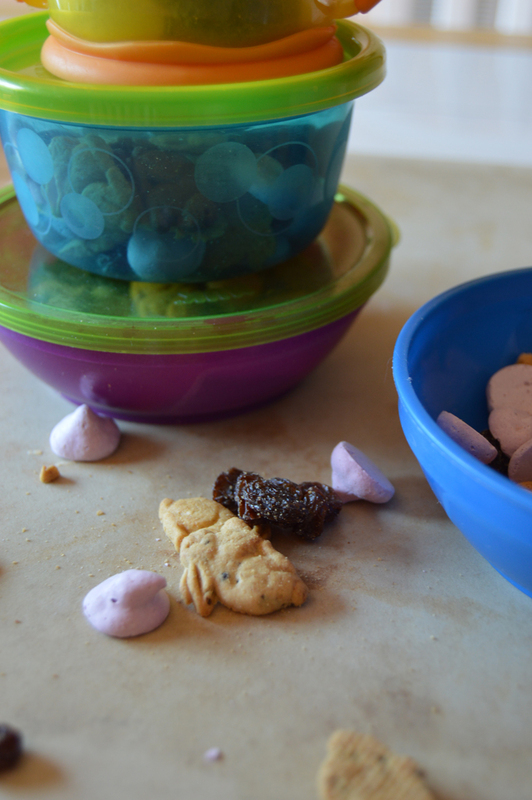 I’ve been making this trail mix with bunny graham crackers and raisins since she started eating solids. I’d have them handy for her while sitting in church, on road trips and for a little snack when she’s oh-so desperate for food, like, 10 minutes before dinner, because she’s a toddler, and toddlers don’t wait for anything. She loves her trail mix, and that’s what matters most! 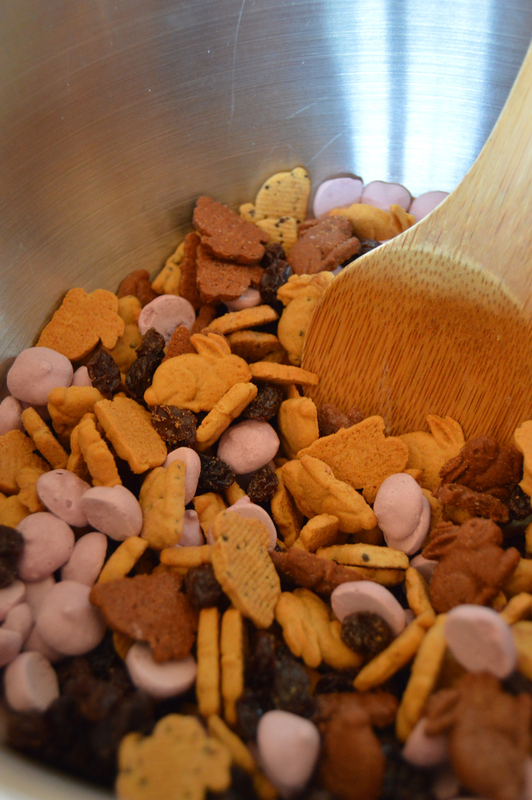 And of course, I’m going to share this super-quick and easy trail mix, which I hope your little kiddies will enjoy too! • Mix three ingredients together, either in a bowl, or shake up in a zip-lock bag, and it’s ready! Easy-peasy!! 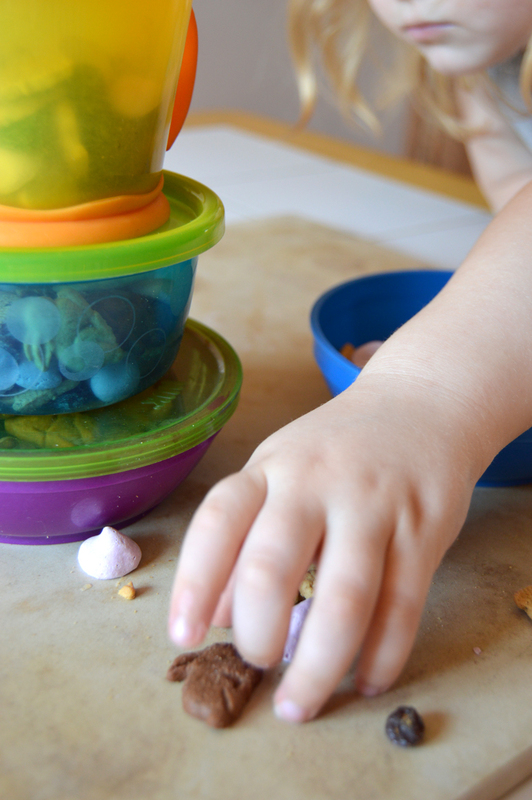 Just fill up your child-friendly containers and baggies and you’re set to go! Don’t leave yet!! There’s more! Mommies and daddies, or anyone for that matter, have to munch on something too!! 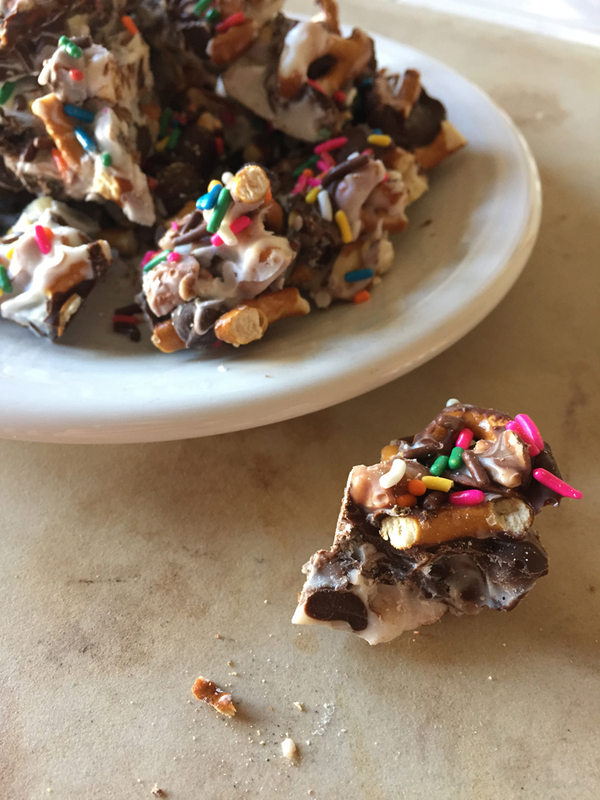 I experienced a chocolate bark/people chow-like mixture at work that was so good that I had to duplicate it, or at least make something similar!! NOTE: If you want to include chopped peanuts instead of the almonds, or use both, that’s up to you. I have a peanut allergy so I left them out. • Place a large piece of wax paper or silicone mat on a large cookie sheet. 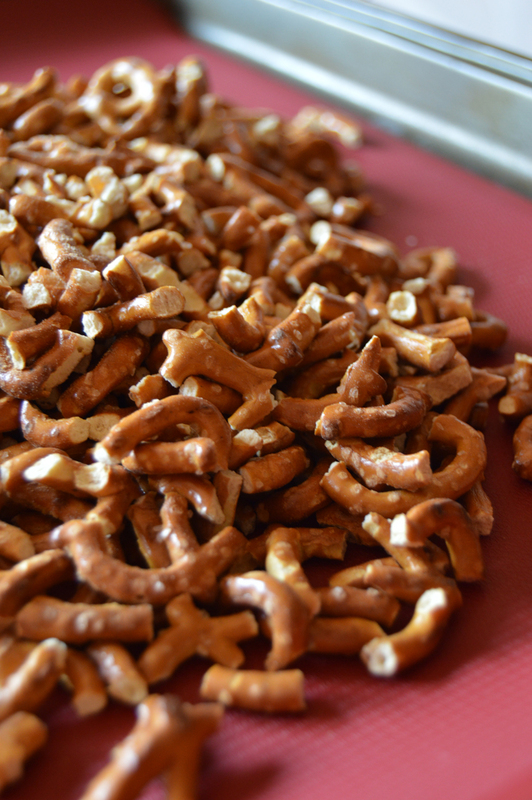 • Place the pretzels in a gallon-size zip-lock bag, and crush with a rolling pin. You want large chunks. Spread pretzels out on the cookie sheet. 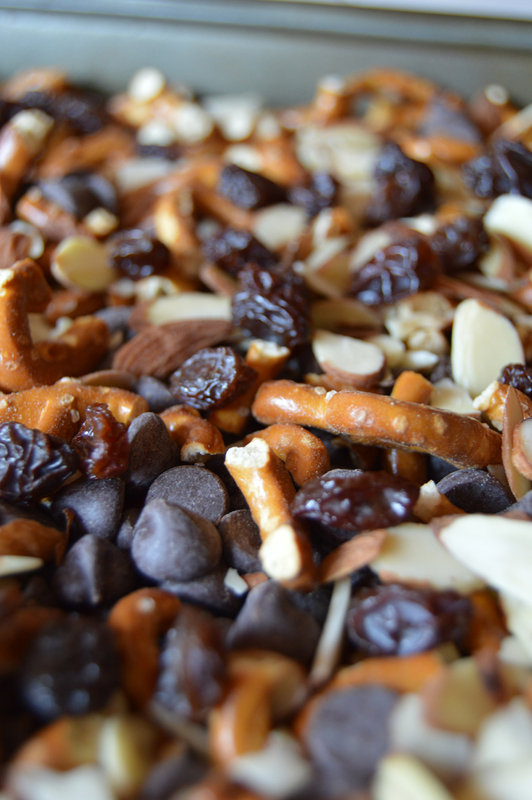 • Next, spread out 1 package of chocolate chips, almonds, and raisins. • Melt the almond bark in a microwave-safe bowl for about 1 minute and 10 seconds, careful not to burn it. Stir it, and place back in the microwave for a few more seconds if needed until it’s all melted. 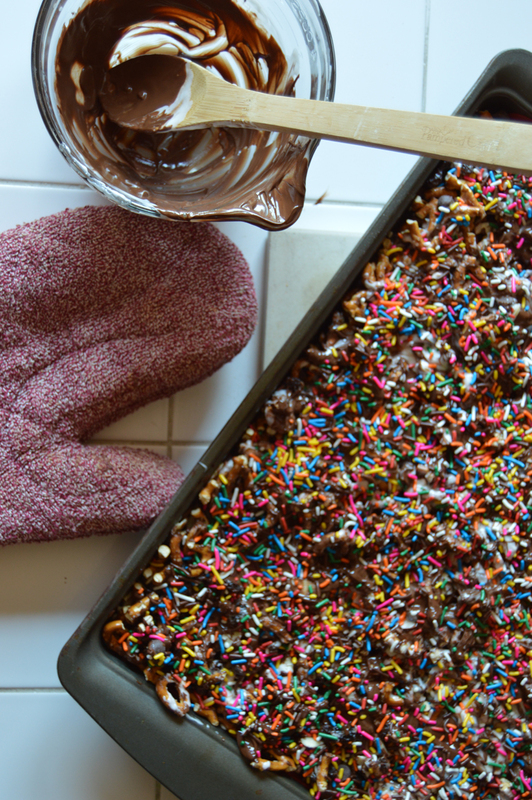 Pour the melted almond bark evenly over the pretzel mixture. Do the same for the other bag of chocolate chips. I used the same bowl as the almond bark, and melt in the microwave for about a minute until all melted. Spread evenly over top the mixture. Gently mix ingredients with a wooden spoon to help the melted chocolate go through the mixture. Immediately top with sprinkles so it’ll stick to the melted chocolate. Place the mix in the refrigerator for a few hours to harden, and then carefully break apart into pieces.